The contents of this website are strictly © Labyrinthos 2019, unless stated otherwise. The following articles from various editions of Caerdroia - the Journal of Mazes & Labyrinths are reproduced here in PDF format. 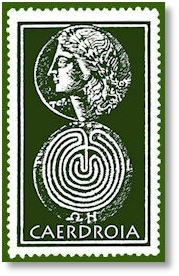 Since it was first produced in 1980, Caerdroia has published a multitude of papers, articles and notes on many aspects of mazes and labyrinths - their history and distribution, usage and development as well as theoretical matters and news items. Much of the material in the earliest issues has long since been superceded, but a full listing of all the relevant items from Caerdroia 6 (the first edition to appear in magazine format) onwards is provided in the Caerdroia Index, also available below. Here then are the articles so far archived for your perusal, a selection from those early out of print editions and a few important items from more recent editions. You are very welcome to open and read these, and also to download them for personal use. For permission to reproduce these articles in any form, please contact us for permissions and procedures. Please note: all of these articles are copyright Labyrinthos/individual authors as appropriate. While you are welcome to print a copy for personal use, unauthorised reproduction and circulation is prohibited without permission from Labyrinthos. Please contact the editor if you wish to reproduce these articles for workshops, publication or use on other websites. More articles from the early out-of-print editions of Caerdroia will be added to this section of the website in due course. If there are specific articles you would like to see added to the Archive, let the editor know, and when he has a spare moment, he may well convert and upload them for you! A catalogue of the many papers, articles and notes published in Caerdroia from 1981 onwards. John Kraft reports on the magical usage of stone labyrinths in Scandinavia. Sarah Coles reports on a carved labyrinth amongst the Roman ruins at Side in Turkey. Ivor Winton looks at a series of printer’s logos from 15th & 16th century Italy. John Kraft documents stone labyrinths in Southern Sweden, associated with prehistoric sacred places. Nigel Pennick looks at the connections between board game movements and the labyrinthine path. Ivor Winton questions the symbolism of the Side labyrinth carving. Graeme Fyffe does the maths, and provides the formulas for calculation of classical and Chartres styles. Damon Williams documents the three former turf labyrinths at Cowley, Oxfordshire. Zeta Eastes recalls the life of her father, a pioneer of modern labyrinth studies and the author of the 1922 classic Mazes and Labyrinths - A General Account of their History and Development. Katherine Barker traces the earliest reference to the now overgrown turf labyrinth at Leigh in Dorset, England. Ivor Winton takes a critical look at a supposed turf maze location in Surrey, England. John Kraft and Urmas Selirand document the historical stone labyrinths recorded in the southeast Baltic. Martin Locock describes the restoration of the hedge maze at Castle Bromwich, England. 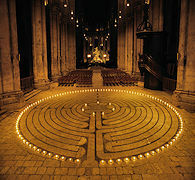 John Kraft's original study of labyrinths in Scandinavian churches, revised & updated by Jeff Saward (2005) with a catalogue of the labyrinths in each of the four Nordic countries where they are found. Hans Lyngsgård describes a Babylonian clay tablet in the Vorderasistische Museum in Berlin, covered in labyrinthine drawings of liver conditions. Staffan Lundén describes a little-known labyrinth legend from Nepal - the city of Scimangada. Paul Hyland goes in search of an Indian cave temple, and stumbles across a labyrinth. Rabbe Sjöberg explains the techniques used to date over 40 stone labyrinths from the coast of Northern Sweden, and the interesting results obtained. Michael Behrend looks at the popularity of Troy romances during the medieval and the etymology of the Julian's Bower turf maze names. Bjørnar Olsen provides an interpretation of the boulder labyrinths on the northernmost coastline of Europe. Marguerite Rigoglioso reports a Neolithic cave painting of labyrinthine form in Sicily. Richard Crossley discovers a lost block maze in Yorkshire, England. Often claimed to date to the Bronze Age, Abegael Saward explains why it is likely that these enigmatic rock-carved labyrinths are much more recent. Lilan Laishley documents the first American hedge mazes - actually hedge labyrinths - in Pennsylvania and Indiana. Ronald Nelson details his process for working with students. Andrew Collins reports a previously unrecorded labyrinth inscription in Jordan. Staffan Lundén describes a newly discovered labyrinth inscription at Knidos, Turkey. Pat Kennedy, Dennis Whetzel & Ron Nelson recount the construction of a new labyrinth at their university in Harrisonburg, Virginia, USA. Jeff & Kimberly Saward go in search of this enigmatic underground labyrinth inscription in Sardinia. Jørgen Thordrup, who died in December 2008, recounts his 60-year fascination. An appreciation of his work, published in Caerdroia 39, is also appended. Jeff Saward explores the 19th century origins of these seemingly modern mazes. Adrian Fisher explains the modern fascination for mirror mazes. Ellen Galo dissects the structure of mathematically 'perfect' labyrinths. John Kraft recounts the stories associated with the Trojaborg stone labyrinth at Visby, Gotland. Roberto Milazzi figures out the designs and locations of the various mazes that appear in Stanley Kubrick's classic movie. Jeff Saward records the details of the mid-19th century tiled labyrinth in St. Mary's Church, recently uncovered for cleaning, and considers the source of its design. Jeff Saward documents the history of the stone mazes and labyrinths on these islands in the far southwest of Britain.